You can see exactly how your emails will look when they arrive with your customer by sending yourself test emails. As the system also tests any personalisation added, the test email can only be sent after you have created a Campaign and added your Contacts to the Campaign Stage. Once you have created a Campaign and a Campaign Stage, go to Send Emails on the main menu and open the Email Scheduler. 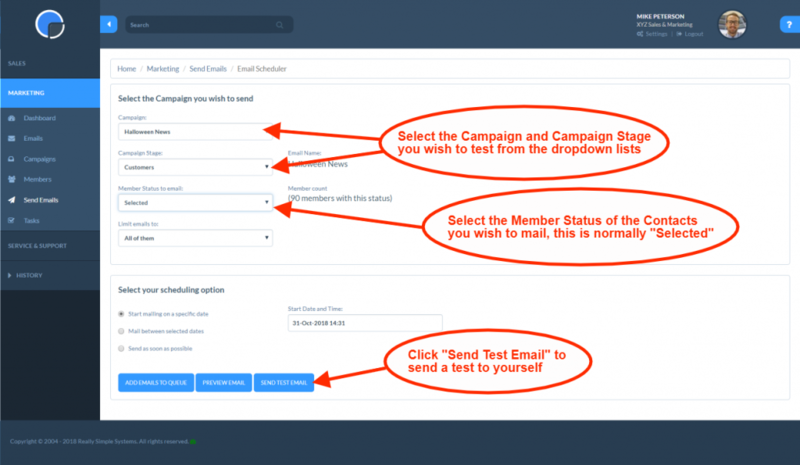 The Email Scheduler will default to the last Campaign you have created or you can select the Campaign and Campaign Stages you want to test from the dropdown lists. At the bottom of the screen you’ll see three green buttons, “Add emails to queue”, “Preview email” and “Send a test email”. Click “Send a test email” and check your inbox for the email to arrive. If the buttons appear “greyed-out” check you have an active status showing in the “Member Status to email” box above – this would normally be “Selected”, i.e. the contacts you have selected to mail. However, if you have already scheduled or sent the email, you could select other options if you wanted to resend or reschedule, for example, “Queued” or “Mailed”. Top tip – If you are frequently testing emails you might find it useful to create a Test Campaign where you can switch the attached email to test it. You can add just one contact, maybe yourself, to activate the campaign and you’ll them be able to change the email in the Campaign Stage to the new one you are working on.